Located in the heart of Central Florida’s most thrilling amusements and attractions just three miles from Disney, Barefoot’n Resort is only a 10-15 minute drive away from hotspot destinations such as Celebration, Universal Studios, SeaWorld, Wet n’ Wild Waterpark and more. The fun-filled Old Town and Fun Spot America theme parks are just next door, but guests needn’t worry about obnoxious crowds: this family-friendly resort is tucked away from the noise and bustle up against lapping lake waters, and past guests often happily note that the resort has a calm and quiet atmosphere, a welcome relief after days spent touring the always exciting but often crowded nearby theme parks. Spacious, elegant rooms, a free-form outdoor pool and simmering hot tub, charming wildlife, gourmet restaurants and kitschy farmer’s markets, an enormous selection of shopping and attractions, world-class service, a five-star location, even complimentary WiFi- this gorgeous resort has it all! So whether you’re looking for a family getaway to Disney, a romantic couple’s retreat into the serene Florida wilderness, or a solo trip in the Orlando area, Barefoot’n Resort is the place to stay and the place to fall in love with all the wonderful lights and sights of beautiful Central Florida. 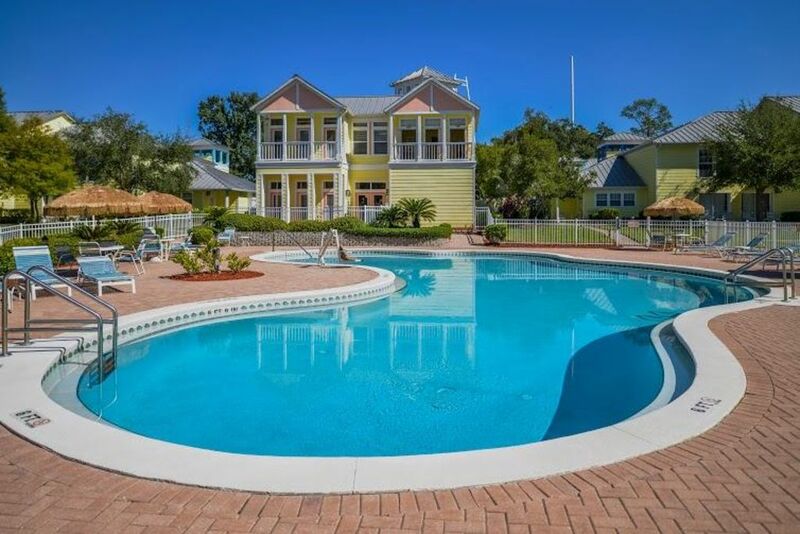 Barefoot’n Resort beckons relaxation with the allure of spacious one-bedroom accommodations featuring a deluxe queen or king bed, a private patio, balcony, or terrace, and a partial kitchen featuring coffee maker, microwave and mini-fridge. Enjoy a eating together around the dining table, or in the living room before relaxing with a late-night movie on the cable TV, equipped with DVD player. Afterwards, feel free to head out onto your furnished patio to enjoy the night sounds and gentle warmth of Central Florida. A queen sofa sleeper is also included in this cozy unit for your convenience. This wonderful resort features more than a five-star location: world-class service, a relaxing atmosphere, and amazing amenities such as free-form outdoor pools, muscle-melting hot tubs and spa services, lake access, complimentary WiFi and more. Relax poolside while the kids splash around the children’s pool, head over to the Picnic and BBQ areas for an afternoon get-together in between trips to Old Town and Fun Spot across the street, and retire to your spacious, cozy rooms for the night after a day well-spent golfing, swimming, playing, sailing, fishing, shopping, laughing, and loving life. Just off of Hwy 192, the highly-rated Barefoot’n Resort offers easy access to fine dining, outdoor and retail shopping, golf courses, and all the best Orlando attractions and theme parks. Walt Disney World, Universal Studios, Wet N’ Wild Waterpark, and SeaWorld are all under twenty minutes away and Orlando International Airport is only 25 minutes northeast. Daytona Beach and Cocoa Beach are less than an hour’s drive away, and Central Florida fun such as swimming with dolphins at Discovery Cove, riding hot air balloons, ziplining and riding horseback, swimming in crystal clear lakes while admiring the gorgeous wetland scenery, Battling Darth Vader at Disney or taking the Hogwarts Express is all at the tips of your fingers when you stay at Barefoot’n Resort. This was a great place for our family of four during our Disney World trip. It was very spacious and everything was very nice. Staff was very friendly and helpful. 2nd stay, we will be back! This is a perfect spot to stay. We had a one bedroom condo on the 2nd floor that had a big bathroom with a large tub and separate shower. It had a separate living room with a kitchenette that was stocked with dishes, silverware, toaster, coffee pot with coffee and tea and a microwave, sink and mini fridge! The living room had a table and 2 chairs to eat at and a washer and dryer. Couldn't ask for more! Pretty pool with coastal chairs that sadly we didn't use this time but very cute! We were very satisfied with our accommodation. The property was clean, staff was nice and it fit our needs and budget perfectly. We were in a One room suite with kitchenette which had plenty of precisions to meet our needs and expectations. The location was perfect for getting to the theme parks and only about 1.5 hours to the beaches. The resort was clean, well maintained, and gated. The condo itself was exactly what we anticipated. Great value! This was a beautiful and LARGE suite for the price! I was expecting something that would just be okay, but I really was blown away. My stay was too short and quite rushed, and I wish I could have stayed longer just to enjoy the property to the fullest extent. Plenty of parking spaces available, bathroom was huge with a big tub, separate shower, kitchenette was well stocked, really I can't think of one negative thing. The bed was also very comfortable! Great location and the one bedroom was fantastic. Beautiful one bedroom. Very clean and a great location. Pool was wonderful. We plan on staying here again next year. I recommend this resort to anyone. OTHER THINGS TO KNOW - Check in Time: 4 pm - Check Out Time: 10 am - Minimum age requirement for check-in is 21 years of age. - All Guest Suites are Non-Smoking - Pets are not permitted and strictly enforced with the exception of Service Animals. - Photo ID and credit card for $100 security deposit due at check in (cash is not acceptable for deposit). - Resort fee of $6.95 per night plus tax required at check in. - Resort Fee includes use of amenties including guest computer and heated pool. This property charges a mandatory resort fee due at check-in. Please check listings for details. Rates subject to change. Click "Book it Now" for rates and availability. Reservations may be cancelled up to 8 days prior to arrival. A cancellation fee of 25% of the reservation will be charged. Cancellation requests made 7 days or less prior to arrival are non-refundable.